We looked like we were about to enter a circus tent. 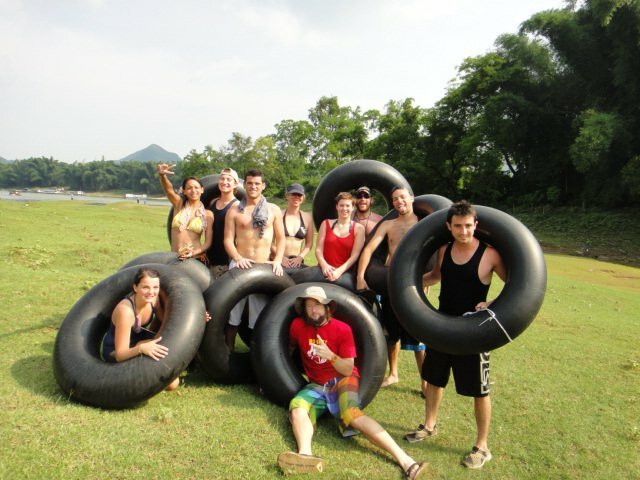 There were 11 of us packed into a narrow back alley of Yangshuo, each armed with a inner tube nearly as big again as ourselves. We bumbled and bounced down the narrow corridor until we emerged into a throng of Chinese tourists clustered by the river taking pictures. After getting over their initial shock, the Chinese Borg, as one, refocused their long lenses on our clown troop. We bungled our way through and soon found ourselves on the fast moving bank of the Li. 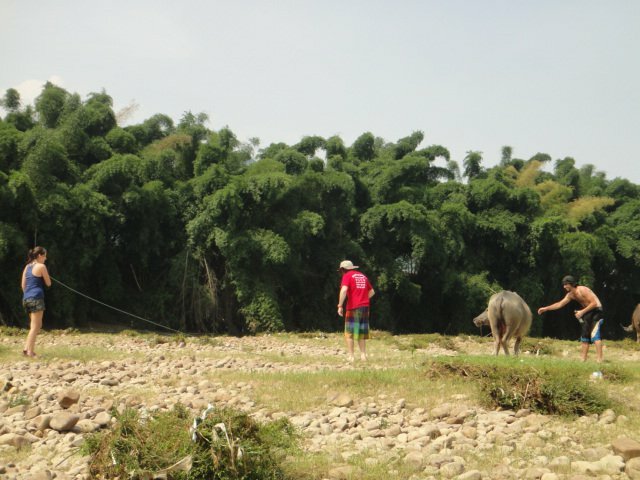 The recent flood-waters had receded but there were still mops of bamboo and trash cruising by. 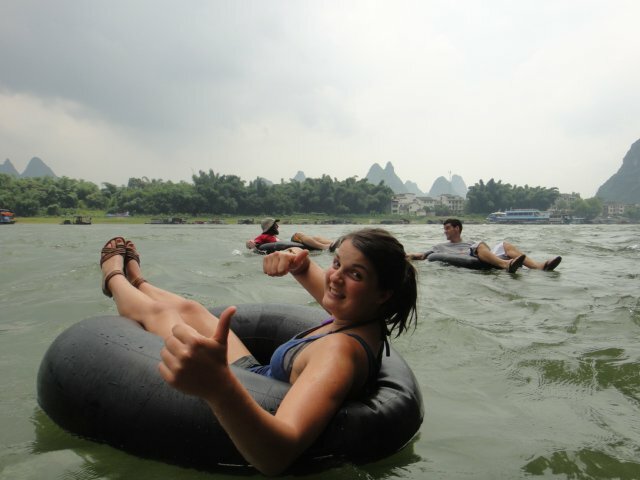 Large tourists boats churned up and down, dark logs swam by like crocodiles under the murky water. Were we really going to do this? Monkey Jane, our loud and awesome hostess, commanded us to go. Maybe its from surfing but I tend to jump and worry later. So I leapt. And off I cruised faster than I imagined, the group slowly waddling in like drunken penguins behind in the distance. The strong current quickly strung us out like a string of beans and the flow took us right under a snarling white-water wave under a toothy cliff. Abort!! I flapped my arms, but inevitably, one-by-one the current pushed each of us next to the cliff only to spit us out next to big churning tourist boats. Another frantic push, and finally we popped into the placid water nearby. Our little armada was reunited and relieved. On we floated ... Chinese tourists on fake bamboo boats were dressed up in their fresh dresses and nice clothes. They stared in amazement at our bravery, or stupidity, and then laughed when we called out for pijou. And since it was 100 degrees out and about 99% humidity, they may have been a bit jealous as well. The water was cold and the only respite from the constant layer of sweat one tended to wear for clothes around here. Later on one of the boys found a cliff. We grabbed onto the limestone and managed to pull in our rubber boats. The cliff was sheer and high and promising, but there was no telling what lay below in the dark current. Matt jumped first, tentatively, feet first. He popped up and yelled "Its great!" Soon we were doing dives and flips and then came backflips, each time struggling back upstream and clambering up the sharp rocks. But then we noticed the rest of our fleet had nearly disappeared down the river, they were only little ants bobbing in the distance. Yeah Lisa and your waterproof camera! Eventually we came to an island which inexplicably had a small herd of water buffalo lazing around. Due to the state of pijou the boys were in, they were inspired to try and ride one of the big cows. Alex was a brazen Jewish guy (which meant he'd just gotten out of the military), and walked right up to a big one. We watched from afar and realized that he didn't notice it was protecting its calf. "No matter how this ends, its going to be great," I commented. I pictured Alex running around madly being chased by the cow, stumbling over the rocks. Instead he stared at it, then walked closer and closer. Unbelievably, he began to pet its nose. He was BeastMaster. I walked closer as well, but then the girl turned and started pawing and huffing again at me, it was about to charge. OK, fine, I don't speak Buffalo. Alex and I pondered the best way to jump on. I told him he should run from behind and leap, legs wide, like the movies. But after the realization that this animal probably weighed as much as a car and had horns as long as our arms, we dropped the riding plans--it was a huge blow to the squad. But just as soon a new plan was hatched. Matt grabbed the free end of a long rope, of which the other end was tied to the nose of another large horned beast. Matt began to swing it like a huge jump-rope, and the boys jumped in immediately and began skipping! The beast wasn't too fazed, he just swung his head every once in a while to avoid the rope getting caught in his horns. One of the girls knew a jump-rope song, and soon it was a party. Water buffalo jump-rope had been born; a new sport had been introduced to a town already chock-full of fun adventure.